Not a very spectacular project, but this thing proves to be very useful in summer. 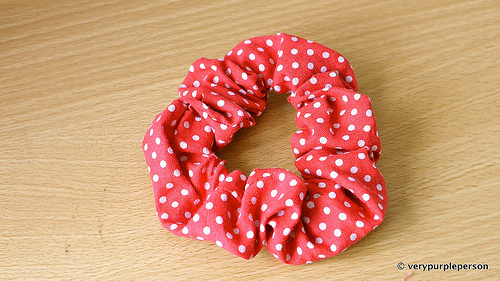 I think it is also called scrunchie, but it is called chou-chou here and I like the name better. 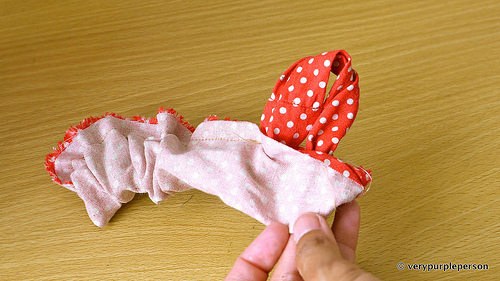 I found several tutorials for making chou-chou, but they always involve hand-stitching, which I’m too lazy to do for such a simple thing. 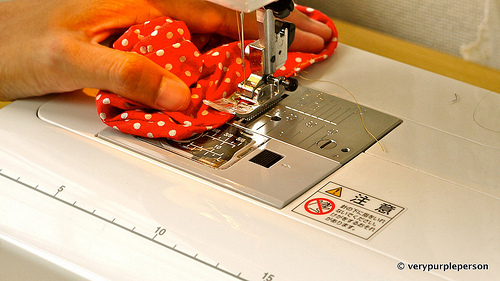 Then I see another way of doing it, it is much easier, and more importantly: no hand-sewing! 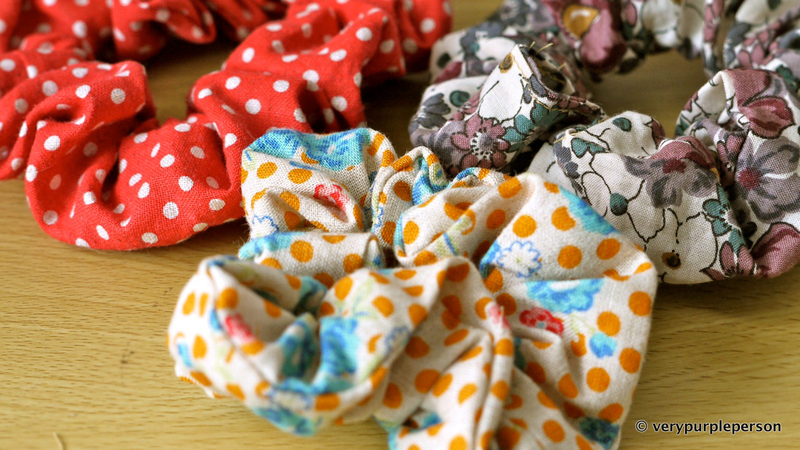 This project only took around 10 minutes to make, and it is also a good way to make use of all the fabric scraps. 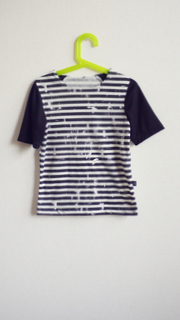 Fabric: 10×50 cm. Use non slippery fabric so the chou-chou won’t slip off your hair. My fabric here is cotton/linen mix. 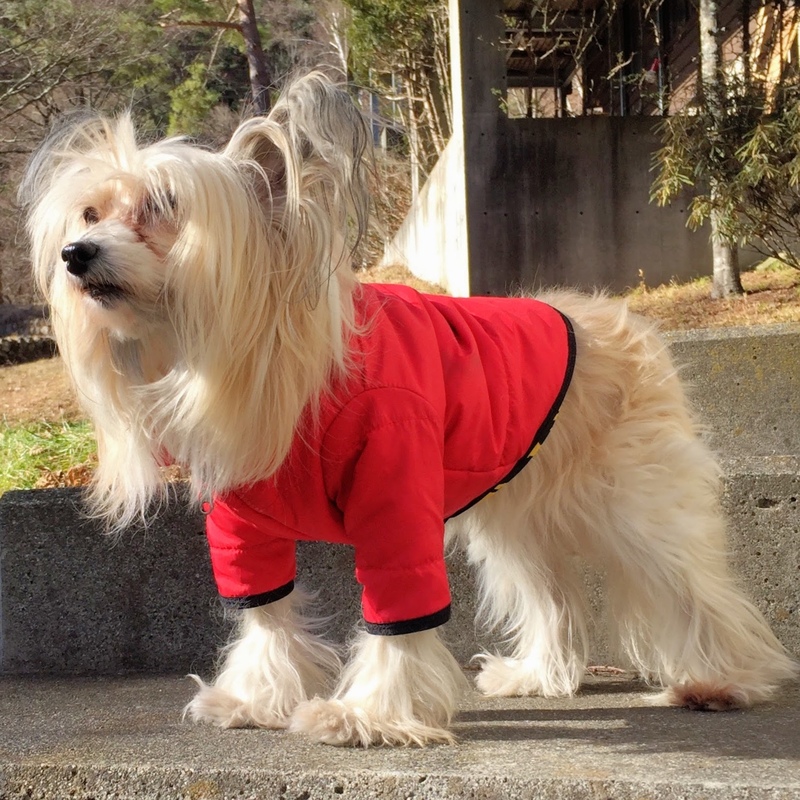 The measurement is not exact, you can make it longer or wider. I just snip 10 cm off my 50 cm cut fabric. 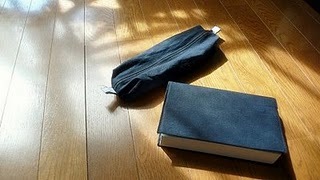 Elastic: 20 cm. 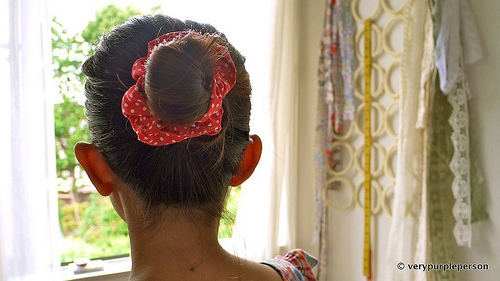 I use ordinary hair elastic, but you can use any thin elastic strip. 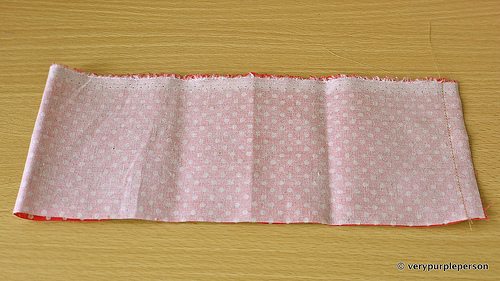 Sew the short ends together with 1 cm seam allowance. 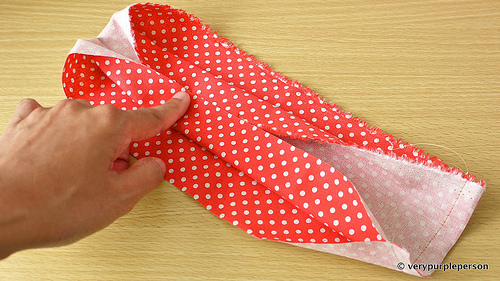 Fold the upper fabric inside as pictured, and hold it with one finger. 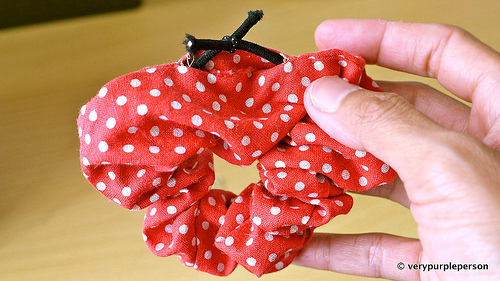 Fold the lower fabric over, sort of wrapping the first fold of fabric inside. 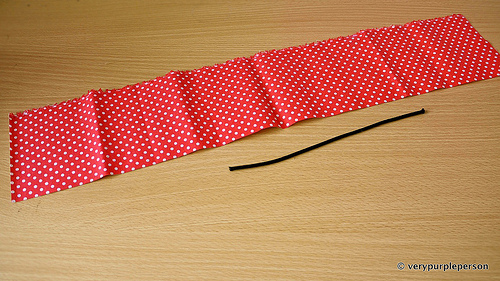 Starting with a backstitch, sew the edge with 1 cm seam allowance. Don’t catch the fold of fabric inside. 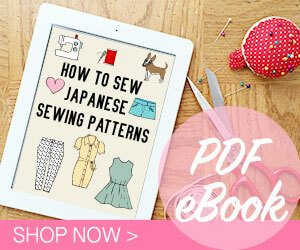 When you almost reach the end, just pull the fold of fabric inside and continue sewing. It is easier done than written here! Stop stitching about 3 cm from the first stitch. 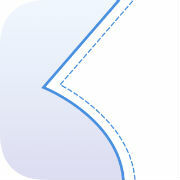 Backstitch to secure. Now you have a sort of crumpled tube with a little opening. Here’s the fun part! Reach into the little opening and pull the tube out. 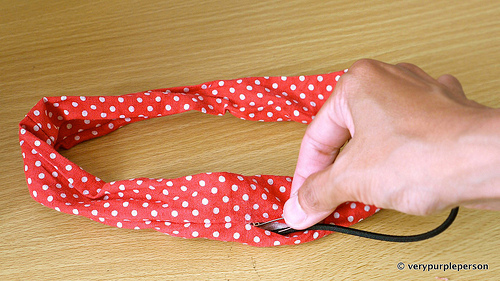 Using a big safety pin, thread the elastic inside. 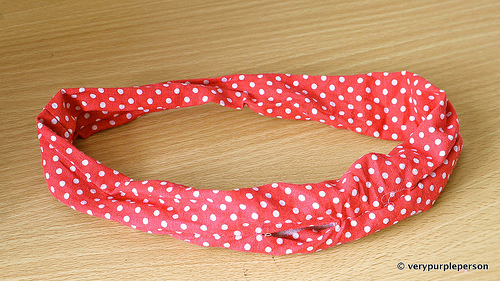 Tie the ends together. 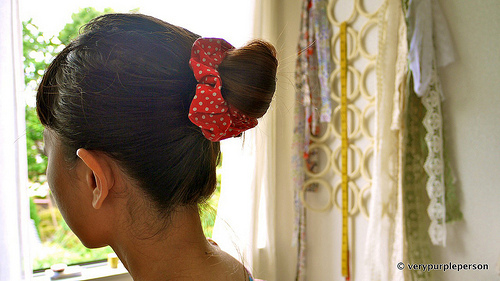 Pull the elastic several times to make sure that it is tight and secure. 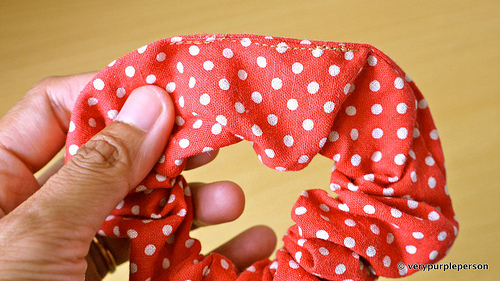 If you use thin elastic strip, you can also stitch the end together. 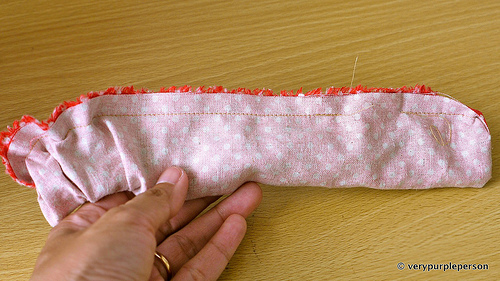 Tuck the elastic inside and stitch the opening closed. Backstitch both ends of stitching to secure. 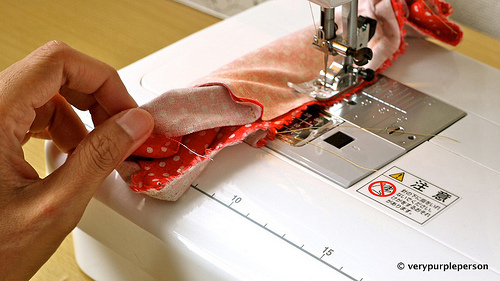 If you want to be neater, you can also use hand-stitching to close the opening. 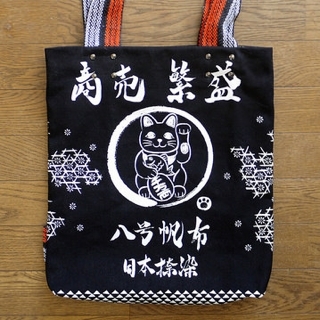 Turn the stitched edge to the inner side and there’s your chou-chou. Then you will want to make more!